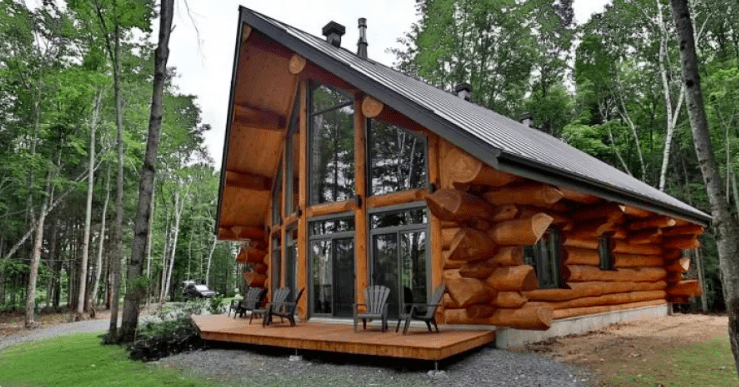 The Bazinet log house is a beautifully crafted log house design that shows you don’t have to build a luxury cabin building to get the wood cabin of your dreams. This cabin building is big on design with plenty of features to love. The exterior showcases all that is great about this log cabin design, from the large logs to the peaked roof and wall of windows to let in natural light during the day. Once you step inside the cabin buiding you enter the open great room with its high ceiling, and incredible spiral staircases that uses handcrafted logs. Upstairs you have the two bedrooms and a bathroom with beautiful log finishes. Everywhere you look in this handcrafted log house you see log walls, posts and beams for a log cabiln building that is stunning. Not every cabin building has to be a modern example of log house designs. Some of the best wood cabins are the simplest rustic designs. Think of the family cabin when you were kids, quite often they were just an old school two-room wood cabin on the lake, which made for perfect memories. If you are looking to build an old-school wood cabin, you will not only save money but still have the cabin building of your dreams. If you want to build a small and simple wood cabin, you are in good company. Small cabin buildings are just as popular as luxury log house designs, and there is something about them that makes them even more special. Small wood cabins capture the rustic appeal of living among the logs. You want to start with the same notions that guided your ancestors, with something small, simple and secure. A traditional rectangle design is less expensive to build than a more elaborate wood cabin shape. A rectangle wood cabin also captures the most usable space when you are trying to do more with less. Finally, building materials and labor costs will be far less when you keep things simple. As you plan your wood cabin, try and think about how you will use it. Maybe it will be a get-away for you and immediate family members, or the wood cabin will serve as a bunkhouse for gatherings of fishing and hunting friends. Or maybe you will use your cabin building only seasonally or perhaps year around. You want to think about the wood cabin experiences you had growing up, maybe a summer camp or a weekend retreat at a friend or relative’s rustic hideaway. Think about the things that made those experiences special, and try and remember the wood cabin’s location or log house design and what made it special. To make the most of a wood cabin space, you want to keep interior partitions to a minimum. A simple great room with a corner that is designated as a kitchen area and a small bathroom can provide a great getaway space for two or three people in only a few hundred square feet. If you need a little more privacy, small bedrooms require less than 100 square feet. If you need additional bunk space, you might consider a small loft accessed by a ladder which can double your available sleeping space.